The Hill Murray Pioneers defeated the Edina Hornets for the second time in nine months as they relied on their penalty kill and timely goal scoring to defeat the Hornets 3-1. 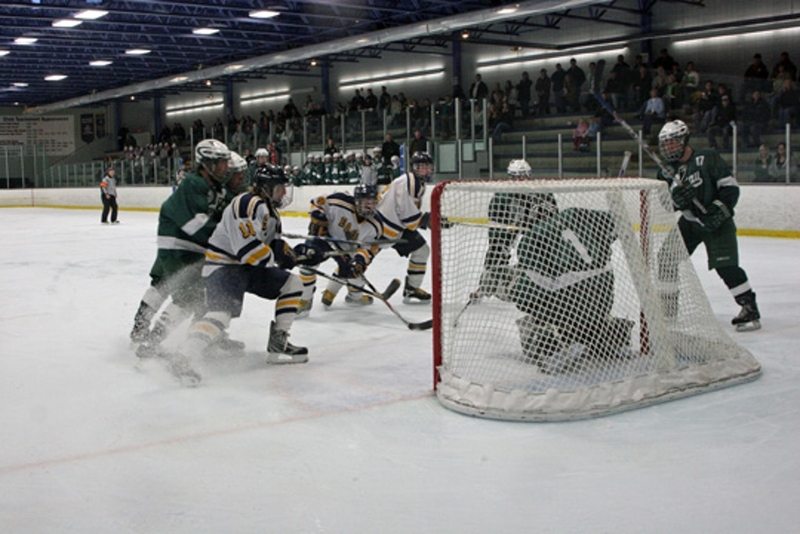 A near capacity crowd attended the game at Braemar Arena to watch two of the best teams Minnesota has to offer. The Hornets brought a potent powerplay that was clicking at 40% entering the game. They were humbled by a Hill Murray Penalty kill that was perfect in five attempts. Jeff Westerhaus scored the game’s first goal at 9:40 of the first period. He scored his second of the game for the 2-0 lead after two periods. Edina scratched its way on the scoreboard as Cole Kretzman scored at 8:22 of the third period. The trio of Nick Widing, Isaac Kohls and Tyler Zepeda were held in check all game until they hooked up on Widing’s back breaking power play goal with just 2:52 remaining in the third period to close out the much talked about game. Hill Murray (2-0) takes to Classic Suburban Conference play with Sibley next Thursday while the Hornets will play Woodbury this coming Tuesday at Braemar. The Duluth East Grey Hounds topped the Wayzata Trojans in non conference action Saturday afternoon in Plymouth Ice Arena. The Hounds scored twice in the second period on even strength goals by Brent Olson and Al McLean. Goalie Matt Cooper made 27 saves in recording his second win and second shutout in as many games. The Hounds (2-0) host Minnetonka next Thursday night for the MyFoxHockey.com game of the week from Heritage Arena while the Trojans face off with Bloomington Jefferson in Plymouth next Thursday. Danny Mattson had 2 goals and 3 assists to lead the Holy Angels Stars to a romp over Northfield in Missota Conference action. The Stars (2-0) handled Northfield (0-1) and maintained puck possession with impressive precision. John Haeg added 2 goals and 2 assists in the effort. Connor Reilly (1g-3a-4pts), and Garrett Faust (3a) each had big nights for the Stars who play Culver Academy Prep next Saturday. Northfield hooks up with a tough Red Wing squad on Tuesday in conference action. After coming off a tough loss to the Blaine Bengals one night before, the Roseau Ram’s traveled across town to battle the Totino Grace Eagle’s. If the first period was any indication, the Rams were in for a long evening as they trailed by a score of 2-0. Ryan Ach and Dan Delisle scored for the Eagles as they dictated play. For Totino Grace, a fast start was important coming off a loss the night before to Thief River Falls/Goodridge. Penalties cost the Eagles in period two as the Rams were put on the power play 9 times including a 5-3 for the period. That swayed the momentum and the Rams scored on the 5-3 as Mike Koenig cut the deficit to 2-1 at 7:58 of the second period. Adam Knochenmus notched a short handed goal at 14:32 to tie it at two after two periods. Each team had plenty of chances through the third period as Roseau goalie Allen Mekash made 35 saves. The game belonged to Eagles goalie Tyler Olson who was challenged all night by the Rams and he was sterling in making 43 saves for the win. The Eagles face off with Blake in the early game on Tuesday evening while the Rams take on East Grand Forks. Archie Skallbeck scored 4 times to lead the Royals in a romp over the North Metro Stars at the Hopkins Pavilion Saturday night. Kyle Dalton set up a pair of goals and scored the game’s last goal for the three point effort. Skallbeck now has 10 points in three games (6g-4a) Center Matt Hazuka also had 3 assists for the Royals who improved to 3-0. Hopkins was 3-6 with the man advantage. North Metro goalie Matt Hauer was busy in goal making 41 saves in the defeat. Hopkins has scored 19 goals in its first three games yet entered the game with a goals against average of 4.00. Alex Fons was perfect in net making 23 saves for the shutout. Skallbeck attributed his team’s sluggish play to a long northern swing of scrimmages last week and said, “We were up early a lot and we were a little tired. I think we have our legs now and feel pretty good.” They will look to continue that trend of looking good with their next game at Hermantown this upcoming Friday. It will be Virginia Moutain Iron Buhl following that. The Stars (0-3) host Andover next Tuesday in North Suburban Conference action. Look out the team on the rise is the Bloomington Jefferson Jaguars who handled the Chaska Hawks 6-0 in Lake Conference play Saturday evening. The explosive Jags (3-0) have carved up the Lake Conference in the early going. TJ Gallus (2g-1a-3pts) and AJ Siro (1g-2a-3pts) led a balanced attack for the Jags who were 2-4 on the powerplay and also scored a shorthanded goal by Joe Faust. Casey O’Connor picked up the shutout in goal. Jefferson plays a non conference game next Thursday with an impressive Wayzata team while Chaska plays host to Eagan in Lake Conference action.